Dave Cockrum and Josef Rubinstein, The Uncanny X-Men #147. Shortly after joining the X-Men, Wolverine comments, “Ten years o’ psycho-training, o’ hypnotism, o’ drug therapy. Ten years of praying and I cut him to pieces without a thought. Nothing changes… I thought I’d learn to control myself, I guess I was wrong and ya wanna know somethin’ funny, I’m glad.” This would place the start of Logan’s rehabilitation around 1965. Wolverine comments that he hasn’t babbled on in years. This is probably a reference to his psychiatric treatments. It is revealed that the Canadian Secret Service used Logan for all of their “…dirty, brutal, necessary assignments no one else would touch…” and that the Canadian government gave him a license to kill. Logan reminisces that he “…was an agent, Canadian Secret Service. Before that, a commando.” It seems likely that Logan was retrained as a military commando and a secret agent at this point, two occupations he had already had experience with prior to Experiment X.
Logan reminisces back to the time when a group of Iraqi militants and mercenaries overrun the American embassy in Baghdad. Logan, as Weapon X, is sent in to assist with the Delta Force raid because of the presence of several Canadians at the embassy. During the raid, Logan kills at least one Iraqi militant and tends to a Canadian nun who is mortally wounded in the crossfire. The nun, who endured extreme psychological torture from the mercenaries, shockingly asks Logan to make the mercenaries pay for their crimes. The stated events of this story, unfortunately, are somewhat contradictory as the American embassy in Baghdad was closed in 1967 due to Arab-Israeli conflicts and Delta Force was not formed until 1977 under Colonel Charles Beckwith, some 10 years later. The most likely explanation is that Logan was referring to the American Special Forces. Marc Silvestri & Dan Green, The Uncanny X-Men #251. 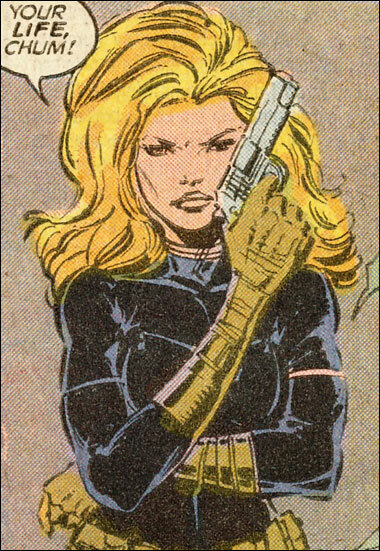 Rogue, using Carol Danver’s absorbed memories, reminds Colonel Michael Rossi that Carol and he ran their first mission together in Berlin, and that, for a time, they were lovers. Carol Danvers and Logan reminisce about Carol teaching Logan how to play poker. Carol remembers it taking place in Saigon, and Logan remembers Tokyo. This would suggest the two spent considerable time together on missions in the Pacific basin. Logan confirms he used to go hunting in Alberta, Canada with a native-Indian Canadian Mountie by the name of Lightfoot who was nearly as good a tracker as Logan. Logan and an extraordinary female intelligence agent by the name of Charlemagne reminisce about earlier days when they lived life on the edge. It is conceivable that the two worked together in intelligence during the late 1960s when Logan worked for Canadian Intelligence and Charlie was a freelancer. This is the most probable placement as Charlie is not surprised by the presence of Logan’s claws during a later meeting in Berlin. Logan meets with a former friend, Shiori Masukuma, a field agent for Japan’s Intelligence Agency and one-time lover of Asano Kimura. It seems likely Logan worked with her at this time as well as with Asano Kimura. Rogue, using Carol Danver’s absorbed memories, relates how Colonel Michael Rossi and Logan broke Carol Danvers out of Lubyanka prison. Colonel Rossi confirms those events. Carol Danvers, now the dominant personality within Rogue, reminds Logan that she told him to leave her at the Lubyanka prison after being arrested by the KGB, but he didn’t listen. Logan remembers a time with Seraph after he had acquired adamantium claws. It is possible that as an agent, Logan passed through Madripoor and became reacquainted with Seraph. It was also during this period that Logan worked with Viper, prior to her joining Hydra. Leinil Francis Yu, Edgar Tadeo & Gerry Alanguilan, Wolverine #126. 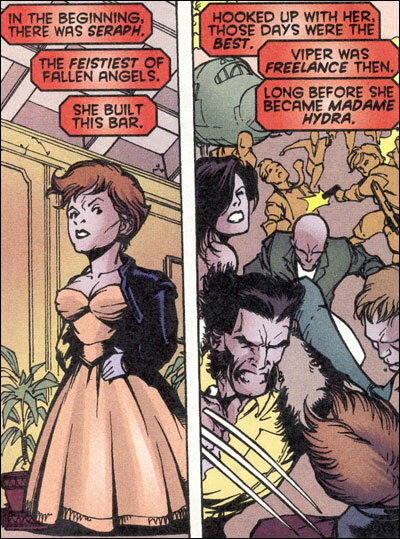 Logan is well known at Madame Joy’s, a brothel in Madripoor from this era. Based on conversations, it seems that Logan was known as Patch and used Madame Joy’s as a safe house and hospital on occasion. Logan tells Alex Summers that he knows “…this place in Mexico. Rowdiest cantina on the Gulf of California.” This would suggest that Logan is quite familiar with many of the cantinas across Mexico. 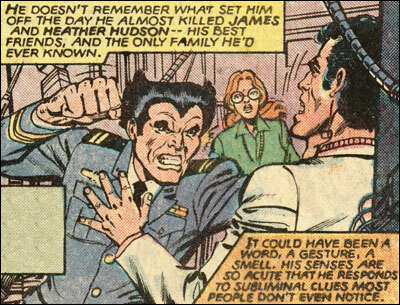 When shown a photograph of a New York prison, Wolverine instantly expresses familiarity with it. “I know that joint. They’ve got the biggest bunch of hardened criminals you could find behind those walls. The lowest of the low.” This would suggest that Logan is quite familiar with maximum-security prisons in the United States. The Chief of Police in Madripoor, Tai, knows when Logan’s birthday is, suggesting that there is a record of his birthday somewhere. One could surmise the date was recorded due to the annual attacks on Logan from Sabretooth on his birthday. Logan professes to despise spy doctors. Perhaps Logan equates spy doctors with the beatings he received from Sabretooth. A photograph shows Logan and a close friend, Blaine, in Laos during 1971. Blaine seems to be aware of Logan’s healing ability and all around nastiness. Blaine reveals to ATF agent Cassie Lathrop that he served with Logan in Vietnam “over thirty years ago.” He also mentions that Logan had an effect on the ladies. Wolverine’s quick recognition of the jungles of Viet Nam suggests that he spent considerable time there. On an uncharted island in the Bermuda Triangle, Wolverine tells Kitty Pryde, “Hangin’ around this rock’s like bein’ on night patrol. You’re always on edge, expecting an attack. You can’t see’em, but you know the enemy’s out there, watching… waiting for you to drop your guard.” This is, undoubtedly, a reference to his time in Viet Nam. When Thunderbird slips into Wolverine’s room, he notices photographs of Wolverine’s past as a soldier probably of his time in Viet Nam. Cyclops states that Wolverine was stationed at NORAD’s Valhalla base in the United States while serving in the Canadian military. Wolverine tells Banshee that he has friends at Valhalla, the NORAD Command Center. Logan vividly remembers a time when, dressed in a Canadian military uniform, he nearly kills James Hudson while Heather Hudson looks on helplessly. “It could have been a word, a gesture, a smell. His senses are so acute that he responds to subliminal cues most people don’t even notice.” After calming down, Logan apologizes and refers to himself as “a government certified, psycho killing thing.” He does credit Mac for helping him get his berserker rages under control. Logan tells Heather that it was she who helped him to overcome his rage and become a man. “General Questions for Chris Claremont.” X-Fan Message Boards, June 16, 2003.